HOBOKEN, New Jersey (WABC) -- A baby girl was born at a home in Hoboken during the blizzard on Saturday afternoon! The road conditions did not allow for the mother to make it to the hospital, and the baby was born shortly after 5 p.m. at 12th Street and Willow Street. Three emergency workers from the Hoboken Volunteer Ambulance Corps helped to deliver the baby. Hoboken Volunteer Ambulance Corps. Received the call 20 minutes before 5 for the woman who was in labor. 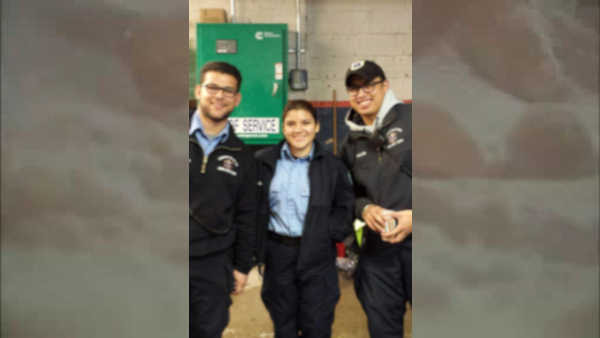 EMTs Michael Vales, Scarlett Guajala and Anthony Grasso assisted in helping the woman give birth. The mother was with her family at home at the time, and there were no complications. Mother and baby were taken to Hoboken University Medical Center, and are both doing just fine.